Estacion Biologica in Laguna de Apoyo Nature Reserve gave a course in tropical fish biology and biodiversity in 2010. The students were from US, Germany, Honduras and Nicaragua. The course was directed by Jeffrey McCrary. There were field activities in Lake Apoyo, Lake Masaya, and in two streams in La Conquista on the Pacific Coast. 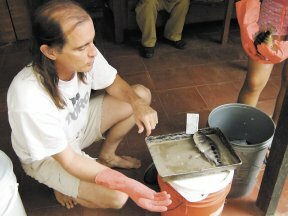 Jeffrey McCrary explains morphological details for the identification of a fish from Lake Masaya. LA PRENSA. 1. Freshwater fish diversity in Nicaragua. 3. Field techniques in population and ecology of freshwater fishes. 5. Freshwater fish ecology and conservation issues. The little Apoyo cichlid, Amphilophus astorquii, in Laguna de Apoyo, Nicaragua. Photo by Ad Konings. The arrow cichlid, Amphilophus zaliosus, in Laguna de Apoyo, Nicaragua. Photo by Ad Konings. FUNDECI/GAIA periodically offers courses in wildlife management, tropical biology, and natural area management. If you would like to register for a course, please let us know!